Rizone Memory Booster is a program to provides a better performance for your computer by freeing up any memory and processes that no longer needs. Although the amount of memory on computers supplied by RAM is usually enough for everyday use, older computers may suffer in this regard. 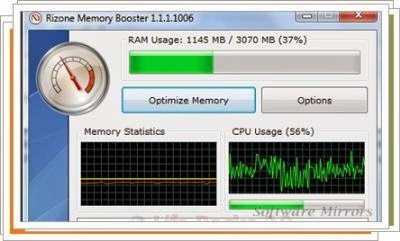 Running Rizone Memory Booster, without prior installation, the application will end those useless processes that spend a certain amount of memory. Among the automatic modes include Rizone Memory Booster intelligent optimization: if active, the application will decide what is most needed by your system. The results of Rizone Memory Booster are not miraculous, especially on computers with many services running in the background, but can be very useful for speed up your computer performance.